This week’s episode of Upodcast we talk to the amazingly talented singer Neeti Mohan who is joining AR Rahman on his “Yesterday, Today, Tomorrow” concert at SSE Arena Wembley on Saturday 8th July 2017.
production. Leading engineers from around the world have been brought on board to present spectacular lighting and visuals as a backdrop to the live sounds of the musical genius, creating a multi-media extravaganza that will provide a once-in-a-lifetime experience for fans and audiences. 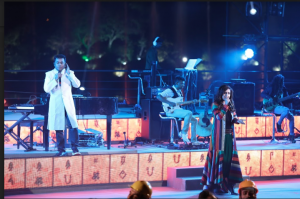 AR will be joined onstage by Neeti Mohan as well as other special guests including Benny Dayal, Javed Ali, Haricharan, Jonita Gandhi, Ranjit Barot and many more. For our review of AR Rahman’s previous concert at the O2, head over here.